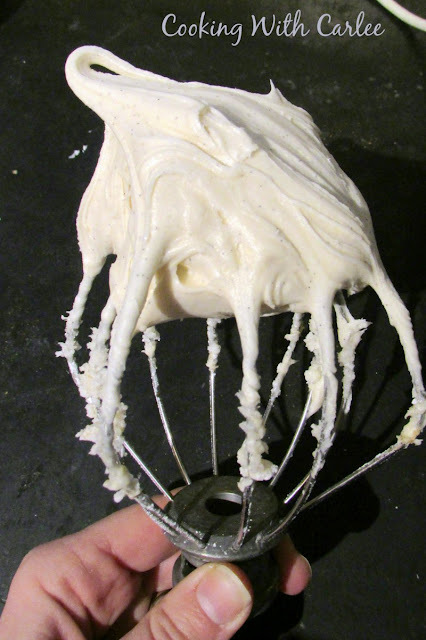 You have to have a great recipe for classic cream cheese frosting. It is a must in any baker's arsenal. It comes together quickly and is perfect for so many kinds of cake. Baking a carrot cake? You have to have cream cheese frosting! Need something for your chocolate cake? Cream cheese frosting! Making a strawberry cake? Wouldn't it be lovely with some cream cheese frosting?! You get my point. Anyway, this is easy and delicious and a must make in any kitchen! Some people do half butter and half cream cheese in their frosting, but I love that this is almost all cream cheese. It leaves that cream cheese tang in tact and is perfect for Linda's Carrot Cake, which just so happens to be where this recipe comes from! I just love the little specks! Mine too. We should really be neighbors, Andrea! Cream Cheese Frosting, one of life's greatest pleasures! Yours sounds outstanding! Cream cheese frosting is my all-time favorite frosting flavor. I love putting it on chocolate cake. Or ANYTHING for that matter! This recipe sounds really good because it's made with mostly cream cheese and not half butter. It definitely ranks right up there for me too! I love cream cheese frosting in all of its forms, but I really like how much this one taste like cream cheese. Yum! Ooooooo I agree Carlee, I like to see the little flecks of vanilla in the frosting, too :) Perfect timing for Easter my dear! Those little specks just make it feel extra special! Thanks! it definitely ranks up there for me too, but it is hard to pick a favorite!